Instead of serving up all-beef hamburgers, make a mixture of half lean beef and half ground turkey. Make your grilled hamburgers even tastier by adding toppings like pineapple rings or unique fruit salsas. Instead of serving up all-beef hot dogs, grill up some chicken or turkey dogs. Instead of handing over high fat ice cream treats, get creative this summer and have fun with your kids by making your own frozen fruit pops. They’re simple to make, and molds can be found at many stores. 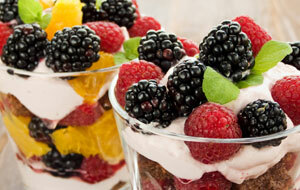 Instead of serving up a bowl of high fat ice cream, serve up a low sugar yogurt parfait. Layers of yogurt, fresh fruit and granola make an enticing parfait, and it is as colorful as it is delicious and healthy. Instead of microwaving movie theatre butter popcorn, air pop your own popcorn and add a flavorful topping. Air popping requires no oil, and you can get creative with toppings like garlic powder, a mixture of spices, or even a very small drizzle of agave nectar. Instead of offering soda, make a flavorful fruit spritzer with sparkling water and a fruit juice, like pomegranate or orange juice.